The United States Mint on Monday at 5:00 PM ET will discontinue the introductory prices for the 2011 Medal of Honor Commemorative Coins. 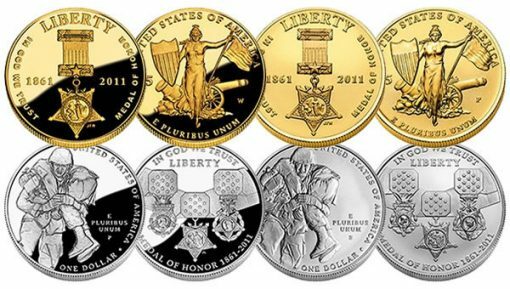 These 2011 Medal of Honor Commemorative Gold and Silver Coins will have their prices raised by $5 after 5:00 PM ET on March 28. Each of the commemoratives will have their prices raised by $5, an amount and percent increase much more noticeable on the silver dollars than on the more expensive $5 gold pieces. However, sales in the past typically are not significantly hurt following a transition to standard pricing as buyers most interested in collecting commemorative coins make their purchases early. The Medal of Honor coins were released on February 25, 2011 in collector proof and uncirculated qualities and in gold and silver. The following are the current prices and what they will increase to after 5:00 PM on Monday, March 28. The far right column includes the latest Medal of Honor Commemorative Coin sales figures as published by the US Mint as of March 20. The current sales levels are substantially short of the maximum mintages. The Medal of Honor Commemorative Coin Act (Public Law No: 111-91) authorizes a total of 100,000 $5 gold coins and up to 500,000 silver dollars. Each commemorative may be purchased directly from the US Mint on its website (http://catalog.usmint.gov/) or through its toll free number 1-800-USA-MINT (872-6468). The Medal of Honor is the highest award for valor in action against an enemy force that can be bestowed upon an individual serving in the U.S. Armed Forces. Fewer than 3,500 Medals of Honor have ever been awarded. The obverse or heads side of the $5 Medal of Honor Gold Coins show the original 1861 Navy Medal of Honor. The reverse or tails side features an image of Minerva in front of a Civil War era cannon. She is holding a shield in her right hand and a Union flag in her left. The obverse of the Medal of Honor Silver Dollars show the three current Army, Navy and Air Force Medals of Honor. The reverse depicts a contemporary Army infantry soldier carrying a wounded soldier to safety under enemy fire.